This sweet, fruity syrup is very easy to make, so I have developed the recipe as a large batch (I use a big stock pot)…also because it keeps for a month in the refrigerator and makes a great host/hostess gift. Look for pretty bottles in your local craft store or in some towns there might be a store that specializes in brewing ingredients and equipment and they often have good deals. Just make sure the bottle is clear glass so that you can take advantage of the gorgeous color and it needs an airtight top. 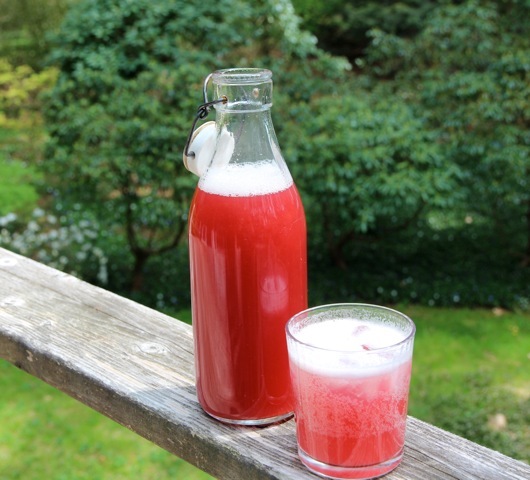 Choose vivid colored stalks of rhubarb to maximize the unique rosy/coral/pink color of the finished syrup. In the pic above the syrup is mixed with lime flavored seltzer, but my friends like using it for gin and vodka drinks, too. Reduce the ginger to 2 ounces if you want it to be more of a subtle background flavor. Combine all of the ingredients in a large pot. Cook over medium-high heat, stirring the ingredients a few times until mixture comes to a simmer, then cover and simmer vigorously until fruit breaks down, about 15 to 20 minutes. Cool. Strain through a very fine-meshed sieve/strainer, pressing the solids to extract all of the juice. Pour into airtight containers and refrigerate until needed. May be refrigerated for up to 1 month. Simply mix with sparkling water in whatever proportion you like, or use to create new cocktails. Mixes wonderfully with gin or vodka.